Due to the allergies suffered by some guests we do not take pets and we do not allow smoking in the cottage. Port Isaac is well situated for many activities -there are several golf courses within a few miles, surfing at nearby Polzeath and for the serious surfer the well known Fistral Beach in Newquay is about 30mins away. The world famous Eden Project is also 30mins journey and there are numerous National Trust properties such as Lanhydrock House within easy reach. There are a number of family based attractions such as the Shire horse centre in Wadebridge (10mins) Trethorne leisure farm (20 mins) and further afield, Flambards and of course Lands End. There are numerous outstanding walks from the village and a cycle track along the Camel Trail to Padstow which can also be reached by ferry from the village of Rock. Shopping etc: Port Isaac has a local supermarket and there is also a large branch of Tesco in Wadebridge(10 mins) There are several eating places in the village ranging from pub to smart restaurant and there is also a takeaway - as the cottage is in the heart of the village, all are within walking distance eg the pub is about 2 mins from the front door of Eastcliffe. There is a local bakery, a greengrocer and a Post Office which also has a range of casual clothes and souvenirs. Several small shops also sell gifts whilst the main street has a local artist's gallery and a converted chapel houses a local potter. There is also a small aquarium and,in the same building, a wet fish shop. The village: Port Isaac was famous in the last century for its kippers, herring caught by the local fishermen and smoked in the fish cellars next to the beach. Although herring are no longer caught here in great numbers, there are still several families who make their living from the sea whilst many more have boats of some description and several have licences for pleasure trips. Port Isaac is a working port and boats can be seen daily landing their catches of shellfish. There is a good and safe swimming beach at the next village about 5 mins walk away and a vast sandy beach at Polzeath about 5 mins in the car. The washer and dryer are in a separate laundry area. A travel cot is available for babies free of charge but otherwise Eastcliffe is designed to accommodate a maximum of 4 guests-including children. Parties of more than this number cannot be accommodated and will not be accepted. We love this house and the location. The house is cute as can be and very clean. Raised location overlooking the harbour is ideal. Gorgeous views from every room. Because it is raised up above the street it means people walking by don't get a direct look in your windows, but you have an ideal perspective for people watching. A short walk to the shops and restaurants make this a very convenient spot. Having the private gated parking area in back is a huge plus. Parking is at a premium in the village, so it is great to be able to pull up to your back door to easily load/unload luggage, groceries, etc. Large modern bathroom with heated towel rack makes getting ready in the morning a pleasure. Washer, dryer, and dishwasher add to the convenience of this cottage. Will miss it when we leave! The cottage ticks all the boxes. 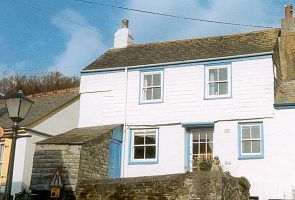 Splendid views of the sea and harbour from all windows - and that's rare in Port Isaac. Another rare bonus is the parking space at the rear - so handy. Meticulously clean throughout. The patio area is perfect for a drink deciding where to eat each night. A short walk to the Golden Lion. And very reasonably priced. This property was perfect in ever way. It had everything we needed and is located in the most desireable spot in Port Isaacs. It was decorated to a high standard and all the fixture and fittings were perfect. The location is ideallic and the views from harbour facing windows are stunning. Everything in Port Isaac was a short walk away, to the harbour, pub restuarants or the chippy. Helen, the owner is a lovely lady and nothing was to much trouble for her. The cottage also has its own parking place with a long drive behind the property and this is real bonus as parking in the town is a no no. A big thumbs up to Helen for allowing us to rent this cottage. Thank you so much Chris and Chris I am so glad you enjoyed your stay and found the cottage has all you wanted. I look forward to seeing you next year. Be part of the village. Lovely, clean, cosy cottage. Very helpful owners who are often around in the village if you need anything or just want a quick chat. Great parking space at the back so you don't have to drag your luggage through the streets like people in the B&B's have to. The steps at the front are steep but this is easily rectified by using the back door via the parking area. Very easy to get to many local attractions and when you get home after a busy day there are plenty of places to eat. Look out for the St. Breward Brass Band who play in the village during the summer, lovely way to spend an evening. You can be busy here if you want to or you can just sit outside watching the world go by, something for everyone. If you enjoy people watching, this is the place for you. Apparently the bus service is quite good too. One warning, for some reason the area seems very popular with dog owners. No Short Breaks can be taken in Bank Holiday weeks or in the peak period but otherwise will be considered.An extra cleaning fee of £50 will be charged on short breaks.